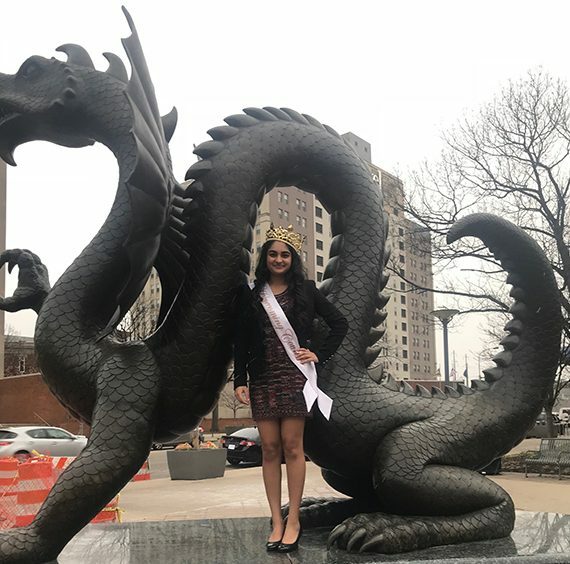 Priyanka Shah, a senior biological sciences major in the BS + MD program, was recently crowned as the 2019 Royal Dragon at the Homecoming basketball game. Homecoming Court nominees were based on their ability to represent Drexel University, campus and community involvement and academic success. This interview was edited for grammar and clarity. The Triangle: What are some of the things you are involved with at Drexel? Priyanka Shah: I am a student ambassador so I talk to prospective students and their families, give tours and help out at Accepted Students Days and Open House Days. I am also treasurer of TriBeta, which is the biological honors society. Outside of Drexel, I am a member of Tenth Presbyterian Church and I am involved in their medical campus outreach, which has panels and dinners. The outreach portion of it is going out into the community and then doing door-to-door blood pressure tests and blood glucose screening tests. It’s important to give back to the community. I think Drexel has given me so many opportunities and I know a lot of other students feel that way, so it’s important to get experience through outreach and just staying involved in the community. I’ve definitely learned a lot by being an ambassador and interacting with people I don’t know, and through TriBeta, I’ve definitely learned a lot of leadership skills as well as teamwork. TT: What made you want to run for Drexel’s 2019 Homecoming Court? PS: Honestly, I didn’t know much about it — my friend nominated me. But once I looked it up and I looked at the process and the things they were looking for in the Royal Dragon, I was like okay this is something I really want to do. I really feel like I’ve pursued different opportunities within the Drexel community and in the Philadelphia community at large so it’s recognition that I wanted. TT: How did you campaign? PS: I had two routes to campaigning. One was reaching out to people who I knew or had known in previous classes or college experience and events — mainly through texting or Facebook messaging. But the second part was reaching out to students I didn’t know. The main way I did that was going to Homecoming events. For example, I went to the bonfire and introduced myself to people or just through talking to people in my classes or walking up to people in the library or the Creese Student Center. I think students were really receptive to the fact that someone was approaching them and taking initiative to get to know them. TT: Were you surprised when your name was called at the game? PS: It kind of felt surreal in that moment. I don’t know whether I was expecting to win or not; I guess I wasn’t really going in with any expectations of winning or losing. What’s interesting was, when I was out campaigning, I would ask people if they were going to the game and some of them said yes, so it was nice to know that people who had voted for me were in the crowd and I had somewhat of a student body support. It felt cool; it felt like the student body was really supportive and I’m definitely grateful for that. TT: What does the title Royal Dragon mean to you? What should this person represent? PS: What Royal Dragon means to me is definitely someone who has taken initiative in the Drexel community and gotten involved in different clubs or activities — maybe not just in the community or in Philadelphia but wherever they are at home. TT: What do you hope to do with your title? PS: There are three main things. I realize that I really like reaching out to people that I don’t know. I guess I kind of already knew that because I am a student ambassador, but I realized through the campaigning process I really enjoy it a lot more than I thought I did. I really enjoy getting to know people; I love meeting new people. I definitely want to keeping doing that. Second, I definitely want to go to more basketball games. I went to the homecoming game and it was super fun and since this is my senior year, I really want to check out more before I graduate. The third thing is, I’m not sure if I get to represent Drexel at certain events, but if I do, I think that would be awesome because I would just be so honored to do that. Drexel has given me so much and I would love to give back in any way that I can. TT: When you first came to Drexel, did you ever think you would end up on Drexel’s Homecoming Court? PS: If you had told me in high school that one day I would be on homecoming court I probably would have laughed. I always thought that — and I realized that most students have this misconception — that it was just a popularity contest, but the initial screening process for Royal Dragon is community involvement and GPA and you have to have a personal statement and everything so it’s definitely more than just a popularity contest. TT: How did you end up at Drexel? PS: The biggest reason I came to Drexel was for the BS + MD program. I loved the accelerated program and I also loved my advisor. Since I’m from Pittsburgh, I couldn’t just walk over to Philly and go meet her in person, but I had quite a few questions about my plan of study and my time here at Drexel so before I even stepped foot on campus, she had a 45-minute phone conversation with me. I also loved the location that Drexel is in. I knew I wanted to go to the school in a big city and Philadelphia seemed to be the perfect fit. I like that we’re in University City so we have our own college town but if we want to be in the city, we can be in center city in 10 or 15 minutes, though we still have green spaces too. TT: What are some of the ways Drexel has changed your life and given back to you? PS: One way I feel like Drexel has given back to me is definitely the opportunities. Most schools don’t have an accelerated BS + MD program. And throughout the whole process, Drexel has been really welcoming. I still remember when I came for my accepted students’ day. There were so many ambassadors that greeted me and there was the whole pep band. It was exciting! Also, just to have so many different clubs and events going on around campus; it’s really good to know that Drexel cares about its student body. TT: What is your favorite thing about Drexel? PS: That is a hard question. I would definitely have to say the faculty here. I’ve had so many good professors and my advisor is amazing — I couldn’t ask for a better advisor. TT: As a representative of Drexel, what do you have to say to the student body? PS: The first thing that comes to mind is make the most of this experience because once you graduate, it’s not going to come back. As I’m getting ready to leave Drexel, it’s really hitting me that college is almost over. I still have a bucket list of things I want to do and places I want to eat. Once you get here as a freshman, I know it can be intimidating to be on your own for the first time, be on a big campus and be in a big city, but definitely branch out because it’ll be so worth it and you’ll have so many good experiences to look back on when you’re a senior. TT: What advice do you have for students that want to be Royal Dragon in the future? PS: Go for it. It’s a really cool experience; it’s a lot of fun just meeting people on the court as well. Just getting the recognition of even being on the court is an accomplishment itself at halftime at the Homecoming game. So just go for it. If you have any fears, you’ll overcome them.